In the tropical village, the camper is not forgotten. 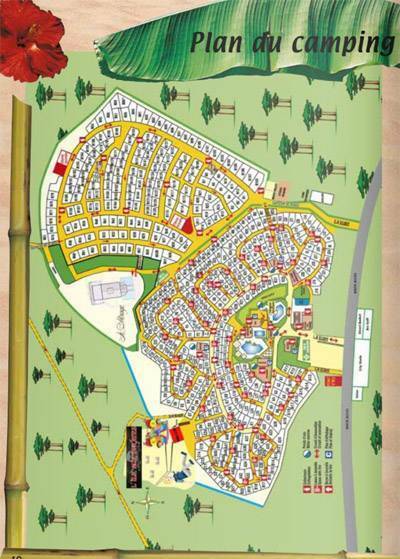 The campsite is rated 5*, offering maximum comfort and services integrated in its standards. With its snail-shaped pitches all around the living centre, its quality sanitary facilities and the tranquility of its small neighbourhoods, Sen-Yan will be your ideal place to stay. We can accommodate large caravans, tents or motor homes. Please let us know so that we can reserve these seats for you. Pets are allowed in some of our rentals (7kg maximum for rentals) and camping, with the exception of animals classified as dangerous. Deposit 300€ (220 + 80) cleaning costs if necessary = 80€. PRACTICAL INFO: don't forget to bring sheets, pillowcases, towels and tea towels. Sheets can be hired on reservation.